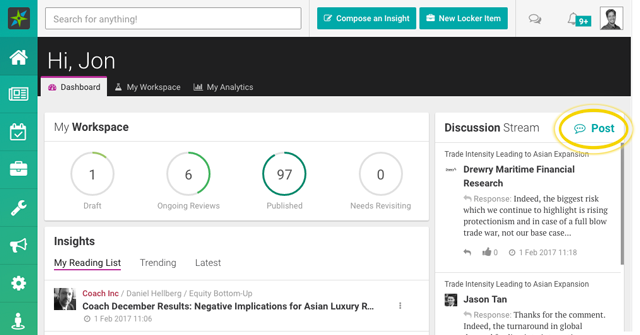 Smartkarma has an active community of Insight Providers and Clients sharing ideas and putting forth their views on Insights and trends. This has been achieved through the Discussion Stream, visible on the right-hand side of your Home page. You can post a comment or question to an existing comment on the Discussion Stream by clicking on it or by clicking the Post button on the top right-hand side to submit a new comment. Alternatively, you can post comments at the bottom of an Insight in the Discussion section or in the Discussion tab under the Entity page. These too will become a part of the Discussion Stream. 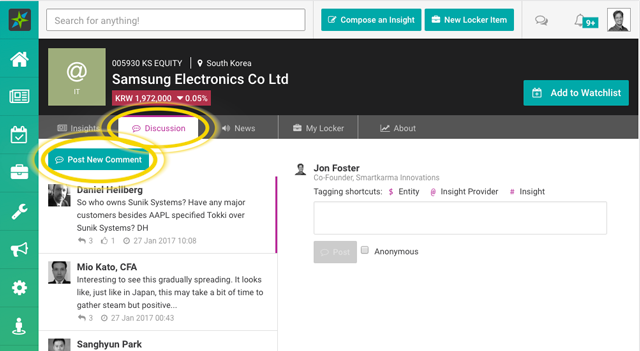 If you post directly in the Discussion Stream, you can use the Tagging shortcuts to tag an Entity, Insight, or Insight Provider. If an Entity is tagged, that comment will also appear on the Entity's Discussion page. And likewise, if an Insight is tagged, that comment will appear at the bottom of the Insight.